Many years ago, in the days of Windows 3.1 and just as Windows 95 was coming onto the market, I bought a copy of a computer magazine, I seem to remember that it was PCW (RIP), that had a 1.44” floppy disk on the front and on that disk was a chess program called Waxman by Ivan Bacigal. The name comes from the fact that ‘Waxman’ looks a bit like the Russian word for chess: WAXMATbI. I got an email from someone this week asking me if I knew how to get it running on Windows 7 Home Premium (64-bit). I had to email back to say that unfortunately Waxman was a 16-bit application and 64-bit versions of Windows can’t run them. What’s nice is that you can setup a position; a feature that is surprisingly absent from a number of versions of chess for Windows; including the built-into-Windows 7 ChessTitans. For the last few weeks as we have been approaching Lent (which begins tomorrow, Ash Wednesday) I’ve been considering what to take up this year as my Lenten discipline. Those forty days before Easter are traditionally a time of preparation for Christians to observe and celebrate the death and resurrection of the crucified Christ, Jesus of Nazareth. It is a time for prayer, penitence, almsgiving and self-denial. Most years I give up chocolate; I want to do that again this year. Some years I choose to take up something rather than give something up, such as more reading or exercise. I’m still in two minds about it, the evening before Ash Wednesday, but I have already uninstalled the Facebook and moTweets apps from my phone and started to remove Twitter clients from my PC. I’ve decided that whatever I decide I will continue to send tweets from my work account during office hours, where appropriate, because that is a part of my job but I won’t keep my Twitter client open unless I’m making and update or checking for @mentions. I guess the most compelling reason for me not to give up social media during Lent is to share with the world what I am doing: how my Lenten disciplines are affecting me, something about Christian witness. …but then again, that’s all about me and not entirely in the spirit of self-denial. When I first joined Facebook a few people greeted me with something along the lines of “welcome to the greatest time-waster in the world!” How many hours have I wasted browsing through page upon page of status updates and notifications that Bob has been gifted a new sheep from Colin? These last few months I’ve found myself struggling with Twitter and Facebook for all sorts of reasons. With Twitter the main problem is that the message stream updates so quickly, especially when using a client such as TweetDeck that updates in real time. 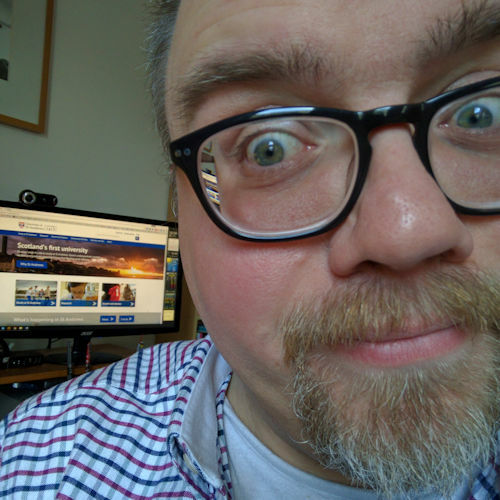 There is then a certain anxiety about missing ‘something important’: that life-changing URL announcing an exciting new Web service, that critical status update from a friend (or ‘friend’), the latest news headline from the BBC. Which is, of course, nonsense! The other thing is that 140 characters really isn’t long enough to express yourself adequately. Twitter is often referred to as a ‘micro-blogging’ service, but it has made me lazy. It’s the fast-food of blogging: quick and instantly gratifying. But it doesn’t last: have you tried searching for posts you made 4 months ago? With Facebook the problem is voyeurism: it’s easy to watch people, their status updates and photo uploads and think that you are somehow involved in their lives. I’ve felt frustrated these last few months that I’ve not been able to interact with friends more in real life and I suppose I’ve used Facebook, and to a lesser extent Twitter, as a substitute. Which is not to say that either Twitter or Facebook are bad in themselves, I guess they have simply helped foster the laziness that is already in me to withdraw into myself and not engage with others more. I heard someone joking recently that Facebook is for connecting with people you have met in real life but to whom you don’t speak now, while Twitter is for connecting with people you’ve never met but to whom you chat all the time. Dan Hues, associate pastor at Redeemer Lutheran Church in Fresno, California, told The Fresno Bee that the point of Lent is a time in which to grow closer to God. “The point is to leave selfish behaviour behind you, to put off the ‘self.’ Facebook is almost a shrine to yourself, with pictures, status updates, seeing if people ‘like’ you. It’s all about you,” Hues said. I have to admit that I don’t see my Facebook account like that at all. I see it more as offering to other people, whether it’s sharing photos of my family with friends, or silly comments in the hope that it may make them smile. “He was hungry.” Something about giving up Facebook for Lent doesn’t exactly make me hungry. In my understanding, fasting in the biblical tradition involves two seemingly polarized realities: fasting and feasting. At the heart of both is food, not Facebook. […] With respect to social media, (which admittedly can create a lot of distraction) I think the better approach is to ask how social media can cultivate attentiveness to God and others. But surely Lent is about more than fasting, it’s also about self-denial and discipline. It’s about consciously making more space for your relationship with God and if something is acting as a distraction, as I have certainly allowed Twitter and Facebook to become at times, then surely the most responsible action is to step away from it for a while. Now this could all go fabulously well and on Sunday 24 April I’ll be in some kind of cleansed, Zen-like state of tranquility. Or I’ll be addicted to Bebo, LinkedIn and My Space! I’ll see you at @gareth after the resurrection. 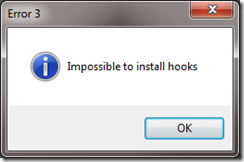 Error 3–impossible to install hooks?! No idea which application it’s from. I don’t remember installing something called “Error 3”. It’s wrong, you know. I’ve installed loads of hooks in my time. Admittedly, installing them on the back of a hollow door is tricky, but it’s certainly not impossible. 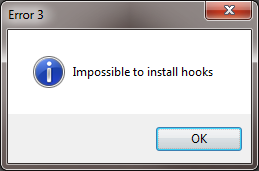 Posted on Tuesday 8 March 2011 Thursday 14 December 2017 Categories ComputerTags error20 Comments on Error 3–impossible to install hooks? !